Shabbona (population 929) is located in north-central Illinois about 10 miles southwest of DeKalb and 10 miles southeast of Rochelle. Shabbona is located in the southwestern portion of DeKalb County. U.S. Route 30 is the main roadway leading to and from Shabbona and connects it to Interstate Highway 39 just six miles to the west. Indian Creek and Shabbona Lake are just south of town. The Burlington Northern Railroad also travels through Shabbona. According to the official website of the city of Shabbona, http://www.shabbona-il.us/ , the village of Shabbona Grove was organized in 1872 about three miles south of the town's current location. The town moved to its current location following the railroad tracks that were laid there. It even "swallowed up" the then existing town of Corntown. The town is named after a famous and courageous Indian Chief named Chief Shabbona. 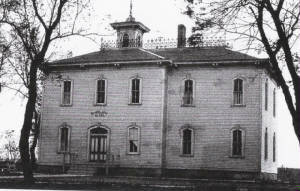 A grade school of some sort was in place by the late 1800s. It is likely the high school followed shortly after. Shabbona High School served the community and surropunding area well for over nine decades. It accepted the children of the Rollo School system in 1955. It was not until the early 1990s that consolidation talks took place with its nearby neighbor, Waterman. A consolidation effort between the two school districts became a reality in 1993. The result was the creation of the Indian Creek School District. The high school for the new district was located in Shabbona. The building pictured in black & white above was the original Shabbona High School, which was replaced by a more modern structure (which has also been torn down). The third building to be graced with the "Shabbona High School" name still stands as the current home of Indian Creek High School. Shobbona HS team nickname: the "Indians"
School Fight Song: "Shabbona Loyalty"
For we know you have sand, Shabbona! Dear Alma Mater, Shabbona High! The Shabbona High School Indians and Lady Indians competed hard and were successful during many seasons in their history. They were a great source of pride for the town and school system. The boys competed in baseball, basketball, track, and soccer while the girls were offered volleyball, track, softball, and basketball. School team colors an fight song are needed, as well as the better team records and coach's names. The Shabbona Lady Indians gave the school its highest finish in State Tourney Competition! The girls finished THIRD in the 1978 State Class 'A' Track Meet. The effort of NANCY PURDY led the way with two Gold Medals in the one mile and two-mile runs, an incredible double! The mid-1980s were hi-lited by the three Medals won by DEE DEE JESKE including a GOLD in the high jump in 1985!! 1978-79 Team Finished THIRD in STATE MEET Competition!! Nancy Purdy One Mile Run STATE CHAMPION!! Two Mile Run STATE CHAMPION!! 1984-85 Individual Medalist - Dee Dee Jeske High Jump STATE CHAMPION!! Two undefeated regular seasons, four District titles, five Regional titles, and a Sectional title hi-lited the SHS success in this sport. If you can help fill in the abundance of missing information please send us an e-mail. SHABBONA (48): Wisted 17, Straw 14, Fleming 10, Espe 4, Mullins 3. DEKALB (37): Di. Anderson 13, Berke 6, Pillmore 6, Lundberg 4, Da. Anderson 4, McAllister 2, Land 2. HINSDALE (58): Riessen 17, Haarlow 17, Goulding 13, Brown 11. SHABBONA (56): Fleming 19, Wisted 17, Straw 12, Mullins 8. **Ron Espe was point guard on Shabbona's Cinderella basketball team of 1959. Other starters on that team included Gerry Wisted, Marv Straw, Dennis Fleming and Bill Mullins. A nice article about this team is available at the bottom of this page. The Indians were 8-0 entering the annual DeKalb Holiday Tournament (which featured schools much larger than tiny Shabbona). Shabbona rolled to the title with wins over Rochelle (66-41), Aurora West (69-67), Maine (59-46) and Rock Falls (78-64) in the championship contest. Following that tournament, Shabbona was given a fourth position ranking in the United Press International's ratings of the state's top teams. They ended the regular season 27-0 and began post season play in their own district tournament. They opened with a dominant 102-35 over Hiawatha and captured the title with a 92-48 drubbing of Waterman, who fell to the Indians for the third time that season. Next, the Indians moved to the DeKalb Regional, they started with a 63-38 victory over Genoa-Kingston. They moved into the title game with a 58-33 win over Sycamore to set up the third straight regional title match-up with DeKalb, who had beat them the previous two years. The Indians were able to get over the hump as they triumphed over the Barbs 48-37 to capture the regional title and move on to the HInsdale Sectional to play the host squad. With a jam packed gym of over 5,000 fans the Indians were out-sized by the taller Red Devils and trailed 19-15 after one quarter. Hinsdale's Dave Brown nailed a 35-foot desperation at the halftime buzzer to give his club a 32-25 advantage at halftime. Shabbona found themselves down by ten (41-31) early in the third period, but mounted a come-back to trail just 45-43 entering the fourth quarter. The Indians took their only lead of the game with :19 left in regulation when guard Denny Fleming scored a lay up to make it 54-52, but Hinsdale was able to convert two free throws with :08 left to send the game to overtime. Hinsdale opened the scoring in overtime with two free tosses, but Shabbona center Jerry Wisted put the teams even again (56-all) with a lay in. In the final seconds, with the game still tied, Bill Mullins stole the ball from Hinsdale and made a quick pass to Wisted, who nailed a jump shot that sent the Indians joyfully running into their locker room. However, after a lengthy discussion between officials at the scorers table, it was ruled Wisted's shot came a fraction of a second after the official timer's gun. In the second "sudden death" overtime, Hinsdale won the jump ball and seventeen seconds later Brown was fouled and calmly sank both ends of a one-and-bonus sent end Shabbona's magical season. Notes: Every seat in the gym was filled and hour and fifteen minutes before tip-off. Hinsdale's front court went 6-foot-8, 6-5 and 6-3, while Marv Straw was Shabbona's tallest player at 6-4, Wisted 6-2, Mullins 6-1. The Indians out-rebounded Hisdale 30-17 in the game. Marv Straw was named 5th team all-state by the Champaign News Gazette following the season. **Jerry Wisted went on to have a great college career at Illinois Wesleyan. Wisted was named All-College Confernece of Illinois and Wisconsin (CCIW) in both his junior and senior seasons. Illinois Wesleyan won the CCIW championship Wisted's first three years and finished third in his senior year in which he was named team captain. Is still on the Illinois Wesleyan's all-time scoring list with 1,248 points which ranks him 21st all-time following the 2007-08 season. Also played baseball and led CCIW in RBI in 1963.
beat Central (Burlington) (77-57) in finals. beat Rochelle (51-45) in finals. fell to Ottawa Pirates 71-54 in finals. CLASS "A" SWEET 16 FINALISTS! **The star player for this team was Dan Anderson. In the Super-Sectional overtime loss to Elgin (St. Edward), Anderson had 17 points, while teammate John Espe had 14 points and 16 rebounds. Shabbona had a close call in the Sectional championship defeating Amboy 62-60 in double overtime. The boys of the baseball diamond won one District Championship, that coming in 1948-49. Again team records and coach's names are not currently available. "(Some of) the winningest team(s) in Shabbona History were the boys' cross-country teams of 1960's. While the state was all one-class, Shabbona excelled as one of the best. Shabbona was coached by John Coughlan, possibly the only coach in U.S. history to be honored as National High School Cross-Country Coach of the Year, National Division I NCAA Cross Country Coach of the Year, National NCAA Division I Indoor and Outdoor Track Coach of the Year. 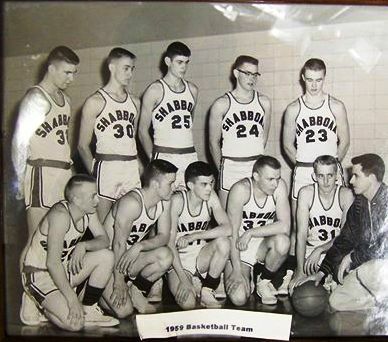 Coach Coughlan left Shabbona in 1967 to lead Maine East High School to a State Championship before becoming head coach at Illinois State University where he retired. Coach Coughlan has been inducted into various hall of fames. As the number one runner on varsity all four years, Joel Espe was also Shabbona's first ever state qualifier in any sport. Shabbona scored 15 points (a perfect score) in the Little Ten Conference in 1966, placing runners in 1,2,3,4,5,6, & 8th place. The team ranked 5th for all schools in the state. Espe earned all-state honors in cross-country and track where he was the first state medallist from Shabbona in the state track finals. His records were never broken in over 40 years of competition. Only two small school runners ever medalled in the 2-mile when the IHSA was all one class. Craig Virgin (3 time Olympian, twice world cross-country champion) and Shabbona's Joel Espe. Espe coached Cross-Country and Track at Fennimore, Wisconsin winning numerous team and individual State championships. His 1981 tream scored 15 points in the Sectional Championship and a record setting 23 points in winning their 5th consecutive state championship. The following year, Espe's cousin, Scott Krahenbuhl medalled in the long jump at the State Finals." Congratulations to Joel Espe, Coach Coughlan, and the Shabbona High School harriers!! Coach Ken Dawson led the Lady Indian roundballers to three consecutive Regional Championships. Included in this string was an overall record of 67 - 6 and an UNDEFEATED regular season record in 1985-86. Coach Dawson's overall record at Shabbona during his nine seasons at the helm was an excellent 143 - 60, a .704 winning percentage!! The girls proved themselves on the vollyball court as well winning Regional Titles in 1983 and 1993. The boys soccer program had their shining moment in 1986 with a Regional title hi-liting the program's success. Coach Gary Richardson led the girls softball program to three good seasons in the four that he coached at the school. Three athletes carried the Shabbona banner in boys track & field. Joel Espe earned a 6th place medal in the 1967 meet, a one-class meet. Presenting the medals to the athletes that year was Jesse Owens! 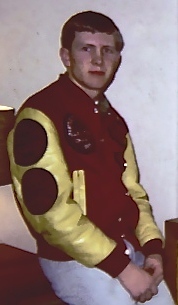 Joel's effort was followed in 1968 by his cousin, Scott Krahenbuhl, who placed 6th in the long jump, again in a one-class event. Derek Jeske won medals at the IHSA State Class 'A' Track in the long jump in consecutive seasons during the mid-1980s! Derek is a brother to the Lady Indians track star, Dee Dee Jeske who also medaled for Shabonna in the mid-1980s (see above). "On January 3rd, 2012, cousins Joel Espe and Scott Krahenbuhl were inducted into the Shabbona High School Hall of Fame. They were the first athletes from Shabbona HS to ever advance to the State Championship in any sport and the first to medal at a State Championship in any sport. Both did so when it was a one-class system in Illinois." **Maurice DeWitte represented Shabonna HS in the 1-mile run in the early 1950s. Maurice would advance through the early meets and qualify for the IHSA State Meet in this event in the spring of 1952. Though he did not earn a medal, Maurice was an excellent example of the talent at Shabonna HS, especially considering his accomplishment was in a one-class track meet system! Scott Krahenbuhl set the conference record in the 180 low hurdles his senior year with a time of 21.7 seconds. He was the first track athlete from Shabbona to ever get a first place finish in the District Track Meet. He competed in the long jump at the state track meet his junior year and senior year he placed 6th, at that time there was only one class. During his senior year, Scott beat the conference record in the 100 yd dash, 220 yd. dash, 180 yd. low hurdles, and long jump. Scott was a varsity letter winner and starter in basketball for two years. During Scott's senior year he had 385 points, 61 steals, 41 assists, and 207 rebounds. He averaged 14.3 points per game and led the conference in scoring with 385 opints. In baseball, Scott played center field. Shabbona was conference champs his sophomore, junior, and senior year. He received the Dr. Harry L. Keene Athletic Award his senior year. Scott attended Northern Illinois University and participated on the Varsity Track Team and Freshman Basketball Team. It may have had a short existence, but the Indians did offer 6-man football prior to World War II as the school was a member of the Northern Illinois 6-Man League. Our thanks to conference historian Tom Sikorski for the information listed below. "A friend posted this site on facebook, with Shabbona High School. It was very interesting to read about. I have NEVER heard that Shabbona when it moved north pushed out a town named "Corntown." And the story on the '59 boys basketball team must've been so exciting! I know some of those guys, but to me they are the dads of some boys I went to school with and were school board members when I was in school. In '59 they were baskeball stars. A great history. Thank you for this site. I also read about Rollo & Lee. I didn't know Lee had been a high school. Thank you for this site and I will also pass it on."